Lion Guardians – Cubs, cubs, everywhere! Home / lion biology / Cubs, cubs, everywhere! We are very excited! 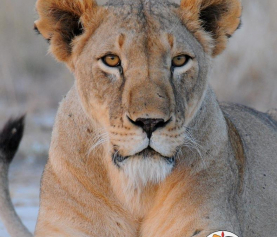 We have just confirmed the 7th set of cubs under 6 months old within Lion Guardian areas!!!! That means that every adult female in our study area is currently with offspring! We’ve never documented such an occurrence before. It seems there is a lot of hope for the future!!! Here is the breakdown: Nemasi has 3 small cubs about 6 months old, Mbalueni also has 3 small ones of the same age, Elikan has 2 five month olds, and Birdie, who lost the cubs we blogged about earlier this year to infanticide, now has new cubs as well! Also, Birdie’s two adult daughters, Nanyorri and Nembirbil, each have small cubs about 2 months old. Even Selenkay has 3 one month old cubs stashed away right on the border of three group ranches. Selenkay is staying with the her small cubs, her two 18 month old female cubs (recently named Neeki and Meoshi by the Lion Guardians), the new cubs’ father, Ndelie, and her sister Elikan. This group is moving between southern Eselenkei and western Mbirikani. Lioness Nimaoi doesn’t have small cubs but she’s still with her two 20 month old cubs, a male named Len’gan’ga and a female named Neluai. Nimaoi is a favorite of males Kasaiyo and Lormanie so it shouldn’t be too long before she too may have some new cubs herself! Also, lioness Nosioki has 3 older cubs, but she is in a northern thick forested area called Osewan which is very difficult to access so we’ve been unable to see her for many months, but the Lion Guardians have been finding her tracks along with those of her cubs and the cubs’ father Pua Mederi. Lioness Nempakai also has 2 young cubs, but she has moved out of Lion Guardian areas and into the safety of Amboseli National Park. You can check out Selenkay, Birdie, Ndelie and Nempakai’s movements at Abycats lion map. 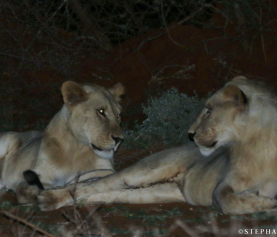 You can see that the lionesses go out hunting every night, but always return to a central location. This is where the cubs are hidden away, while their mamas go hunting and looking for water. We now have our work set out for us! Our big challenge will be to try to keep the adult population as stable as possible – if any females are killed, we will lose their cubs as well. These cubs are dependent on their mothers for several years to help them learn how to hunt and protect themselves. Since we don’t have prides, there aren’t aunties around to help raise the cubs if the mothers are killed. Also, if any males are killed, this may result in new movements of males, which may lead to more cub infanticide which we saw earlier this year between Birdie’s young cubs and Sikiria. The Lion Guardians are out there every day keeping track of the lions’ locations and helping prevent depredations and killings from occurring. In order for this population to grow – these lion cubs are going to have to survive for at least another one and a half to two years. We need your support to help keep the Lion Guardian project running. Please make your donation today. Every little bit helps keep the Lion Guardians on the ground, monitoring and protecting these lions. We will keep you posted as all these new cubs grow and begin to explore the world around them! 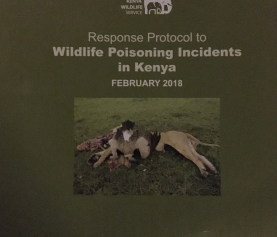 KWS Poisoning Response Protocol Launched! Thank you for this very positve report, with so many Lions breeding and thank you for all of your work protecting the lions. I’m very happy with this news.Thank you for the great work you are doing protecting this incredible animal. I wish there were more people like you. I’m so happy to hear these wonderful news :-)) I’ve been spreading these news on Twitter and do my best to make people aware of the great work you do for the lions. Hope everybody is well.Have you had any rain recently?